PBS's NOVA aired a program about botany that discussed the classification of plants. 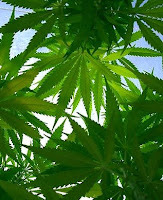 It has recently been determined that groups of plants are related to each other according to their genetic makeup. It's all about DNA. 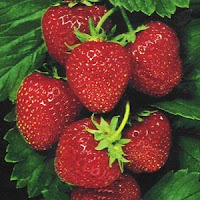 As it turns out, "strawberries and marijuana are closely related." Dudamelmaia is everywhere. The Boston Globe said that he is the nearest thing classical music has to a rockstar. In 2009 Time Magazine named him one of the “100 Most Influential People in the World." He is often described as "the most dynamic young conductor to arrive on the classical music scene since the legendary Leonard Bernstein." This week PBS broadcast the 2009/10 Inaugural Concert of the Los Angles Philharmonic. 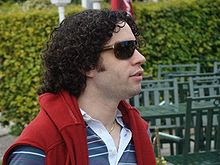 At the helm was their new 28 year-old Music Director, Gustavo Dudamel. Last evening I caught the Great Performances HD broadcast of this inaugural concert with the LA Philharmonic, recorded by PBS for national telecast from a performance at LA's Disney Concert Hall on October 8th. It included the Mahler First Symphony and a world premiere by American composer John Adams (which I did not see or hear). You'd have to be living in a cave not to have heard about this young conductor's meteoric success. Born in 1981 of modest means in rural Venezuela, Maestro Dudamel quickly rose to stardom and now leads one of the world's leading orchestras. It's a rags to riches story that makes everyone happy. But is all of this success truly justified? I'm a natural-born sceptic when it comes to stories of celebrity and fame. However, after seeing Dudamel conduct the Mahler, I really am convinced that he is the real deal. Conducting from memory, he found ways to express every nuance in the music, and was extremely precise and clear in his direction. The man obviously is a natural, and not only has a clear conception of the sound he wants to relay, but has a formative toolkit of gestures to arrive at the intended outcome. For example, his rubato in the Mahler was wonderfully pronounced and elastic - much more so than we usually hear. It's true, he is unabashedly extroverted in his expression, and the audience clearly gets an orgasmic sugar high from Dudamel's expressive ballet, but his approach is honest, visceral, and direct. Obviously Maestro Dudamel does not need my endorsement. He's already a world-wide sensation and megastar. But for the record, I'm on board as a member of his fan club. I just hope that all of this success is sustainable, and that he wont lose sight of the music as he continues to develop. The Great Handini (a.k.a. Maher A. Haddad) is one of America's leading Manualists. He has elevated his instrument of choice to a new level of professionalism. He has increased public awareness about this under-appreciated, but highly refined, technique o f musical expression. A rising star and a virtuoso in his own right, Handini performs the great musical masterpieces of the world, including works by Mozart, Beethoven, Rossini, and Liszt. 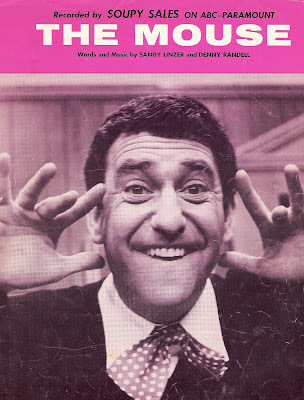 TV personality Soupy Sales (1926 – 2009) died last week. 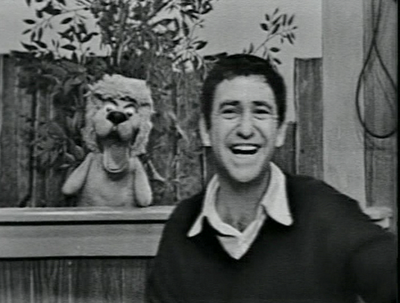 He was a wacky comedian, actor, and host of a well-known New York area television show for children called “The Soupy Sales Show.’’ He died at Calvary Hospice in the New York at the age of 83. 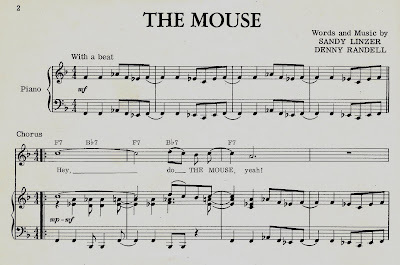 He had a hit song around 1965 called "The Mouse" and I've included a copy of the sheet music cover below. The song's words and music by Sandy Linzer and Denny Randell are not very impressive. The main lyric was the word "Yeah!" I don't recall if Soupy actually sang pitches or not, but here is a sample of the opening music. While his TV program was ostensibly for children, the show attracted older views who enjoyed his madcap, vaudevillian comic style. At times his programs verged on theatre of the absurd. Soupy would push the envelope on live TV in ways that wouldn't be tolerated today. For example, on one program he told his young audience to sneak into their mothers’ purse, extract all the pieces of green paper bearing pictures of presidents, and mail them to him. It resulted in Mr. Sales getting lots of envelopes of cash, and being suspended from his job for a week. The show ran for many years, and I grew up with the earlier programs. I loved the hand puppets and skits. On YouTube you can find various clips from the programs, but here is a later program from the 1970s where he had rock star and composer Alice Cooper as a guest. Cooper is not someone you would normally associate with children's programming. His concerts featured guillotines, electric chairs, snakes, fake blood, and children's dolls. His heavy metal music is grandly theatrical, violent, and designed to shock. I was plugged in, pumped up, and ready to go. My 5.1 surround-sound tuner was online and receiving audio feed over a direct fiber-optic link from a port on the Verizon FiOS cable box The audio signal originating from PBS was clear as a bell, and the picture quality was in HD. I had been looking forward to the experience. 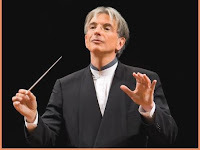 Imagine, the San Francisco Symphony (SFS) conducted by Michael Tilson Thomas (MTT) was about to be transported through the magic of technology right into my suburban living room. Performing in Davies Symphony Hall, the sound and visuals of the program would be realized right before me with digital clarity and holographic realism. The scheduled performance would be a work by a composer near and dear to me - Charles Ives - and I had front row seats. Wow. Now in it's second season of presenting musical portraits, the SFS has gotten into the business of providing content - big time. In 2006, more than five million people viewed three Keeping Score episodes on PBS. Each program was dedicated to a significant of a composer: Ludwig van Beethoven, Igor Stravinsky, and Aaron Copland. I found it to be well-performed and enjoyable. Overall the music was balanced with just enough explanation and historical background to keep the series interesting without beating anyone over the head with "must know" facts. The Keeping Score programs are available commercially in streaming media from PBS.org, iTunes, Xbox, and on DVD and Blu-Ray. Of course, it will be available as a companion concert recording in CD audio format. One would assume that Keeping Score is a profitable venture for the SFS, which like most American orchestras, is under constant economic stress. It also enhances and defines the SFS brand name, and keeps MTT in the national spotlight too. The SFS seems to view this series as an outreach educational program. Their press release reads, "Keeping Score is the San Francisco Symphony’s national project to make classical music more accessible and meaningful to people of all ages and musical backgrounds, and a key component of its almost century-long commitment to music education." 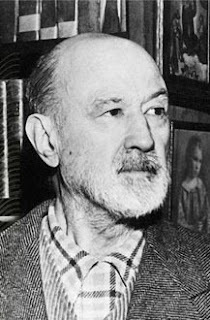 The latest show, Keeping Score: Episode Two, is dedicated to the American composer Charles Ives and his Holidays Symphony. It's packaged as a kind of sonic portrait of Ives' early 20th century New England, and includes visuals to support the background story of the composer. This all sounds great, but after experiencing the program, I had some serious reservations. Frankly, I was outright disappointed. First, there is something odd about seeing and hearing an orchestra perform in an empty concert hall. It lacks the excitement of a live performance and the electricity that is normally generated in that situation. Second, the video photography of the orchestra and conductor drove me nuts. It utilized multiple cameras, and cut between them with the frenzy of someone with a bad case of ADHD. Every shot involved a zoom or motion. The camera on the boom over the orchestra was overused. It seemed like every musical event, even if it was a single note, received a close up of the associated musician. Some shots lasted less than a second. The longer images stayed on the screen for a few seconds, but always involved motion. The impact of all of this audio-visual "Micky Mousing" was not only distracting, but rather detracting. I found myself annoyed by getting up close and personal with individual musicians. Do I really need a Hi-Definition view of the dark nail polish on the fingers of the flutist? As they say, it's too much information. After a while I just closed my eyes. Third, the sonic effect that is critical to experiencing Ives didn't come across as it should. Ives conceived his music to be performed in large public spaces. His orchestral works exploit the physical acoustic of a concert hall. His music is architectural on a large scale, like a skyline of NYC skyscrapers. He layers sound in complex ways that just don't translate well onto recording. While the MTT and the SFS utilized the audience area of Davies Symphony Hall, it came across as more of a visual effect than an acoustical one. MTT would turn to soloists in the balcony, or the chorus in the back. Following the musical cue, colored stage lights would switch on to illuminate the remote musicians, but the music still sounded two-dimensional - even with Dolby Digital 5.1 surround sound. All of these limitations brought back a memory of an Ives concert experience which is the standard by which I measure all others. It was a live performance of the Ives 4th Symphony at Jordan Hall at the New England Conservatory in the mid-1980s conducted by Gunther Schuller. Hearing that large and complex work in that particular concert hall under his baton was a truly amazing experience. It was how Ives should be heard: performed live in a concert hall for the enjoyment of a capacity audience of enthusiastic listeners. No visual frills or HD visual closeups are necessary. Just you and music in its' raw and basic form. I do think MTT understands Ives. The program ended with a few of the conductor's comments and reflections on the how interpret and perform Ives, given the lack of precise direction notated in some of the composer's scores. In the end, all the technology in the world can not improve upon - or even simulate - the experience of hearing Ives in the concert hall. You just need to be there with the musicians in the flesh and blood. To make a definitive "documentary" music video of this music defeats its' purpose. But I will stay tuned for the upcoming Keeping Score: Episodes Three and Four. Perhaps the music video format will work better with orchestral scores conceived from another perspective and with a different vision. The jury is still out on "Classical Music" videos. It seems to be a media format better suited for the glitz of pop culture. To paraphrase composer/rapper Kanye West at the 2009 MTV music video awards, "Michael Tilson Thomas' Keeping Score is good, but Beyoncé had one of the best music videos of all time." Ives is a unique and very special case. If you haven't noticed, today is the worldwide release of the retail editions of Microsoft's latest desktop operating system: Windows 7. Formerly codenamed Blackcomb and Vienna, it has gone through more beta testing than any other Microsoft desktop OS. Windows 7 is reported to address many of the complaints lodged against it's predecessor Windows Vista - which was almost universally disliked by consumers and businesses alike. Microsoft is at a critical junction. Last year their revenues declined for the first time in their history while Apple Computer had record profits. Part of this shift relates to the way people use technology. Personal computers just aren't as popular they use to be. The growth of handheld devices such as iPhones currently outpaces PC sales, and this trend is projected continue - particularly in emerging markets. Having experienced all of the Windows operating system roll outs, I'm quite familiar with the marketing blitz that Microsoft is famous for. This morning Microsoft CEO Steve Ballmer was a guest on Good Morning America talking up their new product (Microsoft is part owner of the MSNBC network). Ballmer explained that Windows was originally a product driven by home users, then it became a corporate-oriented product, and now it's mass market consumer driven again. Sixty-five percent of PCs this year will be purchased by home users, and of them, at least 9 out of 10 will likely be sold with a version of Windows 7 pre-installed. It is estimated that MS Windows is currently installed on a billion computers world wide. But not everyone is jubilant in Microsoft-land. Apple has made significant inroads into the market with their signature and trendy Apple Stores. Microsoft has now reluctantly decided to adapt this direct to consumer business plan. Look for eye-catching and trendy Microsoft stores to open at a shopping mall near you. Google is pushing Android, its new OS for PDAs and smart cell phones. Ballmer has a lot on the line. And if all of these competitive pressures were not enough, Microsoft faces major challenges in China where there 80% their products are illegally downloaded from the net by users. While China will become the biggest market for companies like Walmart and KFC, Microsoft products are easily downloaded from Baidu free of charge. So far Microsoft has been unable to stem the culture of piracy. That outburst by the boss seems a little like something we might see on the popular television program "The Office." Life imitating art, I guess. As for myself, I'm going to wait for the first service pack to be released before I consider taking the plunge. What's the rush? I just signed up for a 2009/10 subscription to the entire concert season of the Berliner Philharmoniker. No, I don't plan to spent a year in Berlin, but through the portal of a virtual "Digital Concert Hall" (sponsored by Deutsche Bank) I am able to attend archived and live concerts via the magic of the Internet. Since 2002 Sir Simon Rattle has been the Principal Conductor of the Berliner Philharmoniker and Artistic Director of the Berliner Philharmonie. The programming is rather good, and includes a number of contemporary works. I'm also a fan of the "Berliner" since their sampled digital sounds were utilized just recently in the electronic realization of my Chamber Symphony composed earlier this year. Attending their concerts is almost like hearing old friends perform. I checked out an archived performance conducted by Semyon Bychhov of Igor Stravinsky's Symphonies for Wind Instruments (1947 version) and Arnold Schoenberg's Verklärte Nacht, Op. 4 (1943 string orchestra version). Not only was the stereo sound superb, but the video was in high definition (if you have broadband). I have no complaints about the technology. It's simply incredible. This is not your father's YouTube. A season pass to access the entire Berliner Philharmoniker-Philharmonie concert series (including chamber music concerts) costs 149 Euros. Individual concert tickets can be purchased for 9.90 EUR. Not bad when you think that you don't have to purchase a transcontinental airline ticket or stay at a hotel. Fortunately I received my season pass as a promotional gift. I like going digital... no traffic, parking, or transportation problems to contend with. No H1N1 virus to worry about. And I can watch it more or less when I feel like it. Ill never leave the house again. Let's call out for pizza delivery. When society assigns a monetary value to art, things get pretty weird. No one will dispute that Italian artist Leonardo da Vinci was good at his craft. What is interesting is that a little known painting that was previously believed to be a portrait by an 19th century obscure German artist has now been relabeled as an original work by Leonardo da Vinci. The painting was once listed in a Christie's catalogue under the name of "Young Girl in Profile in Renaissance Dress" and valued at $19,000. It sold in 1995 for $19,000 at auction. 12 years late it sold again for a just a little more. So far so good. A number of collectors clearly liked the painting enough to fork over about 20 grand for the privilege of hanging it on their wall. That's a reasonable price for what is apparently a very fine painting. I don't know any composers who ever earned that much for a single work. Now it turns out that the painting may not be the work of an obscure German artist at all, but the work of famed Renaissance master Leonardo da Vinci. Over night, its' estimated "street price" has soared from $19,000 to as much as 160 million buckaroos. That's 8,421 times the original price, or a 159,981,000% increase in monetary value. Every brush stroke on the work is the same as it was the day before. What does this say about our celebrity culture? Why are people so prone to assign value based on familiar names and preconceived assumptions? It indicates that the art business is a little like a Ponzy scheme. One collector buys a work, sells it for a ridiculous price to another, who sells it for an even more inflated price to yet another, and so on. The fame of the "Ponzied" artist grows with each sale. Buyer's hysteria starts to feed upon itself as the reputation of the artist mushrooms with each iteration of the scheme. The frenzy continues to ensue beyond logic, and outside of any normal appreciation for the intrinsic aestetic value of the actual work of art itself. 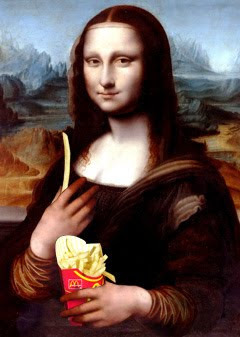 This is all great if you are a da Vinci, but it's a raw deal for the obscure artist. No matter how great their work may be, it's not a brand name. The public wont waist their time with it. "I've never heard of that artist." I'd even go as far to say as this is a form of discrimination. Put yourself in the shoes of that obscure 19th century German artist. One market value for the work was attributed based on his/her identity, but when the painting is associated with a Celeb, it makes world news and translates into big bucks. Are Italians better than Germans? Forget the celebrity status. Use your own eyes folks. Use your own ears too. The rediscovered da Vinci is now locked in a Swiss bank vault. Seems like an appropriate place for a priceless masterpiece, don't you think? The bumper sticker Concert Music Buy Local shown below is the brainchild of Vermont-based composer Dennis Báthory-Kitsz. Báthory-Kitsz is also an engraver, author, editor, and photographer. You can Download a full-size copy and print it (use 11 x 17 and trim it to 3.75 x 15) or order a real one for $5.00 from CafePress (item number 80570307). Contemporary American Concert Music - Fresh Produce for your Ears. Commission and Play Music by Local Composers. Here is an addition to the list from Kuerten-Kettenberg, Germany. Composer Karlheinz Stockhausen (1928–2007) would have been 80 years old on August 22nd, 2008. 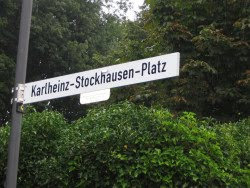 Stockhausen lived in Kuerten-Kettenberg for 42 years where each summer he presented his international Stockhausen Concerts and Courses for New Music. Each year the orbit of the Moon widens by one and a half inches (3.8 cm). At an approximate average distance of 385,000 km, it gradually increases it's distance from earth. The gradually increasing earth-moon distance is related to the slowing of the Earth's rotation as a result of the conservation of angular momentum law in physics. Above is a photo of the earth and moon taken by the Galileo spacecraft from 3.9 million miles away in space. The white line was added to indicate the path of the orbit. But what would happen if the moon broke away from the earth's orbit and went it's own way? I think people would be bummed. It would have a dramatic impact on the physical and psychological well-being of humans everywhere on the planet. If this were to happen, I'd propose that NASA take on a project to construct and place into orbit an artificial moon to aid humanity. It's simpler than it sounds. Several flat and circular geo-stationary satellites could be erected in space above each of the major continents. The lower surface of the huge satellites would house white LEDs on the earth-facing side, and solar cells would be installed on the outer sun-facing side. The substitute moons would store energy during the day, and switch on at night to create a lunar illusion for the benefit of people living below. It could be remote controlled by computer to simulate the changing lunar phases, and even be shut off where we anticipate that a lunar eclipse would normally occur. If the LEDs and solar cells were small enough and could be mounted on a grid, then during the day sunlight would be able to shine through the open spaces down to the earth. The massive project could be paid for with occasional electronic banner advertising - done tastefully of course. True, the Moon wouldn't move around the sky like it does today, but if it were done well, it could look pretty realistic. The number of McDonald's eateries in France is about to reach 1,135. In 2007, France became McDonald's biggest market outside of the US. The newest French restaurant addition will open in Paris directly inside of the Louvre. The French call it McDo (pronounced Mac Dough), and from the track record of Ray Kroc's prior fast food establishments, it will be well-received by the French population, but perhaps not by all. Years ago a French farmer/activist named José Bové, in a defiant act of culinary terrorism, drove his tractor into a McDonalds under construction near his home town of Millau. It was said to be in protest of U.S. trade policy, but I think he just doesn't care for the sesame seed buns. Bové was sentenced to three months jail, but is now a hero of the organic food and international anti-globalism movements. Controversy aside, the majority of French seem to love their "McDo" (pronounced Mac Dough), especially the "French Fries" which head sales on the menu. 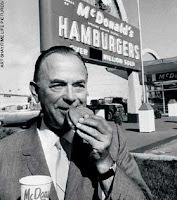 Ray Kroc enjoying one of his hamburgers (photo on left). The first McDonald's in France was built in 1979 and is located in Strasbourg's Les Hall shopping center. It's been downhill from there. Three cheers for the export of American culture! (Now you know one reason why it is difficult for American-born musicians, composers, and artists to be taken seriously abroad). The good news is that there may be a reversal of this global trend. Word has arrived that Iceland will shed itself of its' McDonald's franchises by the end of the month. Iceland's first McDonald's opened in 1993 in Reykjavik, and it's initial customer was Prime Minister David Oddsson. But the devaluation of the Icelandic Krona and high tariffs has made imports too expensive to be profitable (McDonald's Corporation follows a centralized top-down distribution model). As a result, customers would have to pay 780 Krona - the equivalent of $6.36 - for a Big Mac, nearly double what it cost a year ago. Iceland will soon be a McDonald's Free Zone. Although McDonald's currently operates in more than 119 countries on six continents, it has pulled out of seven countries including Barbados and Bolivia. Some would consider that progress. 15,000 American households have adopted monkeys as surrogate babies. 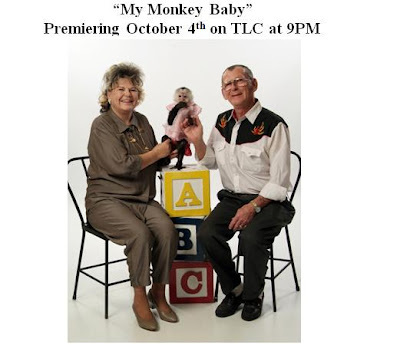 According to a recent TV documentary on TLC, thousands of American couples who can't conceive children on their own have adopted monkeys instead. Monkey babies can cost up to $4,500 to adopt. The show profiles various couples who care for simians and literally treat them like little children - dressing them up in cute clothes, and even applying lipstick and makeup in some cases. One of the long-established requirements for professionals in any field is to continually stay in touch with latest developments in their respective discipline. This "Best Practice" is known as "Professional Development," and the process pretty much applies to every discipline and subject area. Just as we expect doctors to stay informed about the latest advances in medicine, musicians too should keep pace with emerging trends in the field of music. In the spirit of keeping my skills current and evaluating if my creative work is in sync with the times, I regularly make a concerted effort to learn about the latest and greatest trends in music. It forces me to think outside of the box. One of the better barometers of current musical culture is the popular late-night television program "Saturday Nite Live." It is essentially a comedy program, but it features one well-known musical artist or performing group each week. The musical artists selected for the program seem to be a good indicator of current musical trends in American culture, and as a working composer, I consider it an obligation to know something about what's happening in the broader musical spectrum. For example, this past Saturday evening I proactively decided to experience the music of an emerging musical artist working outside of my immediate area of specialty. Although I could barely hold my eyes open that late, in the spirit of Professional Development, I stayed up past my bedtime to watch the featured musical guest. The SNL musical guest artist was a singer/performer who goes by the name Lady Gaga. It is said that her music is influenced by "glam rockers" and select pop singers. I'm not sure what a glam rocker is, but I've heard of a number of the pop singers she is purported to be influenced by: Michael Jackson, Britney Spears, and Madonna (who joined her on SNL as well). Lady Gaga's musical genre falls somewhere in the categories of pop, electronic, dance, and/or 1990s Europop. From reading about Lady Ga Ga in Wikipedia, I learned that she is 23 years old, from NY, and of Italian American heritage. Her real name is Stefani Joanne Angelina Germanotta. My 17 year-old son shared with me that Lady Ga Ga once attended the same summer camp that he did (Camp High-Rock in the Berkshires). Wikipedia says that she grew up in Yonkers, but Ga Ga has indicated on "Leno" that this is a mistake in her bio that she has not been able to correct. She says that she is actually from Manhattan. In addition to songwriting and singing, Lady Gaga plays the piano and synthesizer. She started playing the piano at age 4, and her parents dutifully sent her to study at the Juilliard School when she was 11. After graduating from a private Catholic high school, Gaga was accepted at NYU's Tisch School of the Arts, but dropped out to pursue her musical career. I don't know what to say about her performances. I'm out of my league when it comes to objectively discussing the artistic merit of pop divas. I can be neither constructive or critical of something that I don't understand and can't relate to. Clearly, the musical value of Gaga's work is quite significant, since she has rocketed to fame at such an early age. But from my perspective I found her medley at the piano amateurish, primitive in the worst possible way, and thoroughly unoriginal. Perhaps being clothed in virtually nothing except a cage of large elliptical metal rings hindered Gaga's piano technique. For me, her lyrics seemed single-dimensional and inane. Her voice is bland, nondescript, and vocally limited. In terms of Professional Development, I've done my duty. I can claim to be informed about the latest musical trends - although the Gaga phenomenon seems to be more about bizarre costumes and glitter than musical competency. I will climb back into my cave and re-immerse myself in the world of Elliott Carter, Milton Babbitt, Don Martino, and the second Viennese School. But when someone from modern civilization makes a snap judgement about the limited scope and aesthetic narrowness of my musical influences, I can rebut by saying that I know who Lady Gaga is. I've done my homework, engaged in Professional Development, and subscribe to the philosophy of Best Practices in my field. With all due respect, I can't say with any confidence that they have done the same.